Virginia Gov. Terry McAuliffe visited the Glass Enclosed Nerve center Wednesday, May 25, 2016 for "Ask the Governor." — Virginia Gov. Terry McAuliffe said that he may have met a Chinese businessman, whose campaign contribution has come under scrutiny, once or twice but that the two men didn't have a personal relationship. 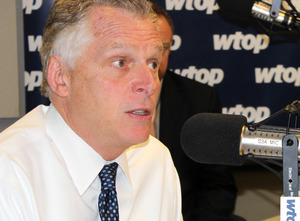 McAuliffe said during an appearance on WTOP's "Ask the Governor" program that his staff is now reviewing past schedules to determine whether Wang Wenliang ever met with McAuliffe or any other state official. He said that its possible Wenliang attended his inauguration. McAuliffe previously said he didn't know Wang and had never met him. "They say that he may have come to the inaugural, not sure. We may have had him over for a cup of coffee with my secretary of (agriculture). So we're having our people pull out all of the schedules. I have had no dealings, I would not know the man if sat in this chair next to me," he said. Contributions totaling $120,000 from a company that is part of Wang's portfolio to McAuliffe's 2013 gubernatorial campaign have come under scrutiny since CNN reported that the FBI is investigating McAuliffe's campaign finances earlier this week. The Washington Post has reported that the probe might also be looking into McAuliffe's personal finances. McAuliffe reiterated that Wang, who holds a U.S. green card, is legally able to contribute to political campaigns. The governor suggested that Wang's interest in Virginia politics likely stems from his involvement in the export of $1 billion worth of soybeans that were shipped from the Port of Virginia to China. The business deal predates McAuliffe term in office. About two dozen other donors contributed larger sums to his campaign, which raised a total of $38 million. Napster co-founder Sean Parker contributed largest sum of any individual donor — $500,000, according to the Virginia Public Access Project, which tracks political spending in the state. McAuliffe also said that his lawyers have reached out to the Department of Justice to learn more about the reported probe. McAuliffe's says the lawyers were told that the governor is not suspected of any wrongdoing. "You live in politics, people throw stones. At the end of the day, I'm focused on being governor," he said. He said the investigation won't affect the presidential race or the campaign of his longtime friend and political ally Hillary Clinton. Virginia is expected to be a key swing state in November and McAuliffe predicted that Clinton would win the state. "The best thing I can do for her is to be a good governor," he said. McAuliffe wouldn't say whether he has discussed the issue with the Clintons. McAuliffe threatened to withhold Virginia state funding for Metro if the rail system doesn't meet certain safety standards. The governor signed an order requiring his transportation secretary and his director of rail and public transit to meet with Metro officials and determine what those safety protocols should be. If the protocols aren't followed, the state would withhold funding. He said the executive directive is intended to serve as a stopgap measure until Virginia, D.C. and Maryland can set up an independent agency that would oversee the safety of Metro. The Federal Transit Administration has temporarily stepped in to fill that oversight role. The directive lays the groundwork for the envisioned oversight agency and requires the state to begin inspecting Metro tracks, cars and other infrastructure, to review accidents and to work with D.C. and Maryland to create budgets, determine staffing levels and address licenses needed before the agency could start its work. The document also requires the state to work with Metrobus and other transit providers to increase bus service in Northern Virginia during Metro's yearlong rehabilitation work that will significantly reduce service and shut down entire stretches of track for weeks at a time. McAuliffe said that safety is the key to ensuring that Virginians, some 300,000 of them per day, continue to ride Metro. But he rejected the suggestion that the transit agency needs new funding. "Before we're talking any more revenue increases, we've got to have a system that works, a system with confidence and a system that is safe," he said. McAuliffe's moves echo steps taken by U.S. Transportation Sec. Anthony Foxx, who has threatened to pull federal funding for transportation projects region wide, not just for Metro, in order force the three jurisdictions to create the oversight agency. He also has said that he would shut down the rail system if Metro does not follow safety directives issued by the Federal Transit Administration. McAuliffe defended his decision to automatically restore the civil rights of more than 200,000 felons saying it was the morally right thing to do. "You've paid your time, your debt to society. Second chances matter ... People make mistakes. They've done their sentence, and now it's time to move forward," he said. McAuliffe's order allows felons who had completed their sentence and any other legal obligations to register to vote, serve on a jury, be a notary public or hold elected office. It did not grant them the right to legally acquire or own a gun. Republican lawmakers have sued arguing that the governor did not have the authority to issue a blanket reinstatement to thousands of felons. Past Virginia governors have restored the rights of offenders on a case-by-case basis and set certain standards under which an individual's request would be considered. "I am the one with the clemency power," McAuliffe said, calling the lawsuit a "step backward." He said the typical felon whose rights were restored had been out of the criminal justice system for 11 years. An analysis by the governor's office found that 80 percent or more those who had their rights restored were convicted of nonviolent crimes and black offenders made up 46 percent of Virginians who did not have the right to vote. So far, almost 5,000 of felons have registered to vote, according to the state Board of Elections. McAuliffe said his staff is checking schedules to determine with whom or when Wang might have met with Virginia officials. He said its possible Wang attended the inauguration or has had a sit down with the sec. of agriculture. Wang made a $1 billion purchase of soybeans to ship to China - a deal that predates McAuliffe. This probe won't stop his effort to campaign for Hillary Clinton. The best thing I can do for her is be a good governor. Thanks to everyone who has submitted questions. We've sent them into the studio. Caller is asking about Metro service. McAuliffe: People have lost confidence in Metro. McAuliffe says he gives high marks to Metro GM Paul Wiedefeld. He stands by Wiedefeld's decision to shut down Metro in order to fix it. McAuliffe says he wants his secretary of transportation to sit with Metro to come up with safety protocols. If they don't comport with Virginia expectations then Virginia will withhold money. Virginia, Maryland and D.C. have agreed on language that would set up an independent agency to provide safety oversight of Metro. But lawmakers won't vote on it until early next year. McAuliffe: Getting all three jurisdictions to agree on that language is a big deal. His safety directive will help close that gap until the new agency is created, up and running. McAuliffe says he doesn't want to talk about any new revenue for Metro until the system is safe and reliable.